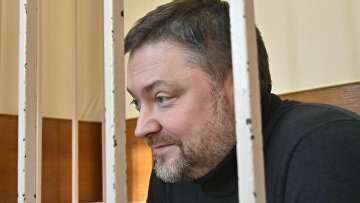 Ex-Defense Ministry’s auditor charged with bribery to stay detained for two more months | Russian Legal Information Agency (RAPSI). MOSCOW, February 8 (RAPSI) – Moscow’s Savelovsky District Court on Friday extended detention of ex-Director of the Russian Defense Ministry’s state contract audit department Maxim Kuksin, who stands charged with taking bribes, RAPSI reports from the courtroom. Kuksin will remain jailed until April 17. According to investigators, Kuksin has received at least 11 million rubles ($165,000) in bribes. He could face up to 15 years if convicted. Kuksin has pleaded not guilty.